I am in LOOOVE with this color. Lilacism is a gorgous light purple creme. In fact, one of my friends this weekend picked this it out to wear because it was "So Springy!" (On a side note...it has become the rule now that my friends come over with a basecoat already on so they can raid my stash while they're here...I love it!). I usually stay away from pastels but I love me some purple and this one was just calling out to me. Glad I went for it! Application was flawless and even, which is not always the case with light colored cremes. I am showing it here with 2 coats and no topcoat. 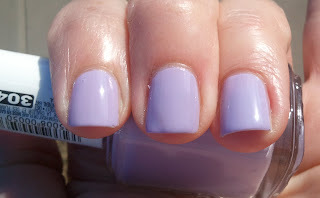 BTW, last week I wore this as a mani and got 4 days chip-free! That's amazing in my book! The light purple leans ever so slightly to the blue side which makes it look positively luminescent in low light. On a side note...is anyone really a fan of the new drug-store Essie bottles? UGH! Next time I'm totally cropping that nasty barcode!